J.S.Watts: Another One That Almost Escaped! J.S. 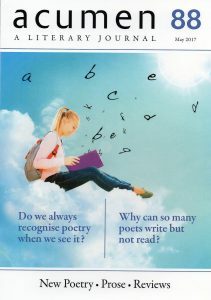 is very chuffed to find that she has a poem in the latest issue of Acumen (issue 88, May 2017). She hasn't received a copy of the magazine yet, but she's guessing the poem is "I am not yet ready to be bird". If you have seen May's Acumen and therefore know if J.S. 's guess is correct, do let her know.